Global professional services firm, Ernst & Young, is to relocate its Hull operation to the city’s prime office complex, Marina Court. The company will leave its current premises in Lowgate and move into its new home before the end of the year. Ernst & Young is the second ‘big name’ company to announce its relocation to Marina Court in recent weeks, following the announcement by Hull law firm Andrew Jackson that it has taken 19,000 sq.ft. to become the complex’s first ‘newcomer’. Marina Court was purchased by local property specialists, the Wykeland Group, last year and is currently undergoing a £1m refurbishment with the work being undertaken by local contractors Hobson & Porter and Voase. The 39,500 sq.ft complex occupies a prime two-acre site with parking for 131 cars and has been home to a number of well-known businesses over the years. Ernst & Young’s Yorkshire senior partner, David Buckley, said: “This move marks our commitment to the market and investment in the regional economy. It is part of a wider plan to expand our offering in Yorkshire over the next five years. “Companies in East Yorkshire are active in both local and overseas markets and we are ideally placed to connect them internationally to accelerate their growth plans”. 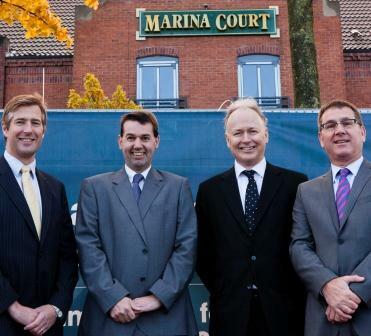 Senior partner at Hull, Alan Kirkman, said: “Our move to Marina Court is a milestone in our long history in Hull. Marina Court is becoming a professional services hub for the city”. Rob Richardson, Wykeland’s Asset Manager, said the acquisition of Marina Court and its refurbishment had once again put the complex at the top of Hull’s office accommodation wanted list. He added: “With firms such as Andrew Jackson and Ernst & Young in residence, the complex will certainly play a key role in Hull’s commercial activity in the years to come”. Pictured is Rob Richardson and Ian Franks of Wykeland with Alan Kirkman and David Buckley of Ernst and Young.